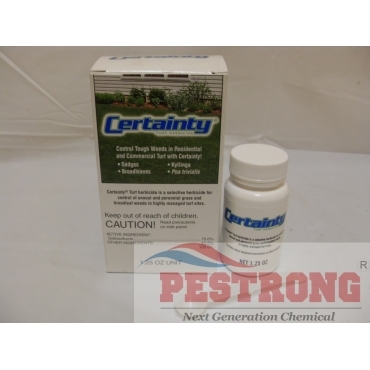 Where to Buy Certainty Herbicide, Certainty Turf Herbicide - 1.25 Oz - $77.95 for Sale with Fast Free Shipping! Certainty Turf Herbicide - 1.25 Oz is a selective herbicide for control of annual and perennial grass and broadleaf weeds in highly managed turf sites. This product is a postemergence, systemic herbicide with limited soil residual activity. It provides postemergence control of many annual and perennial sedges, grass and broadleaf weeds on highly managed turf, sod farms and native grass sites. It is a selective herbicide that can be used over the top of many perennial warm-season and selected cool-season turfgrasses. Dallisgrass Supression in Bermudagrass can also be expected, and is often times desired. Follow label directions. One of the toughest weeds to control Buttonweed can also be supressed with Certainty turf herbicide. Annual bluegrass control in non-overseeded turf can be expected, and is often times desired. Use hand-held sprayer or pump sprayer with 1~3 of small scoop or 1~2 large scoop per 1,000 sq.ft. per 2 gallon of water (small/large scoop provided) for spot control. Yep, this was the best price I found for Certainty. Unfortunately the product had absolutely no effect on ANY of the weeds in my yard. I don't know if the product is old, or...?! Re-treated with absolutely no effect. I can say with "Certainty" this was a total waste of $88! I have used certainty over bermudagrass to kill poa and sedge together plus some broadleaf weeds like colver bonus. Easy to use into the tank sprayer. I found certainty here, lowest price.....Thanks.